Four thousand homeless and underprivileged children received over 10,000 new toys at LA's largest Christmas Toy Party on Saturday, December 15. Dolls, skateboards, balls, stuffed animals and every kind of toy imaginable was distributed by hundreds of volunteer elves. The Family Christmas Celebration was held at the Fred Jordan Mission, on the corner of East 5th and Towne, in downtown Los Angeles. Mickey Mouse and Minnie Mouse delighted the children singing Christmas Carols as part of the spectacular Christmas show. Boys' and girls' faces lit up with joy and wonder when they saw the mountain of new toys. For most of these children, these will be the only toys they will receive this Christmas. Volunteer elves will also be cooking warm cookies for everyone. 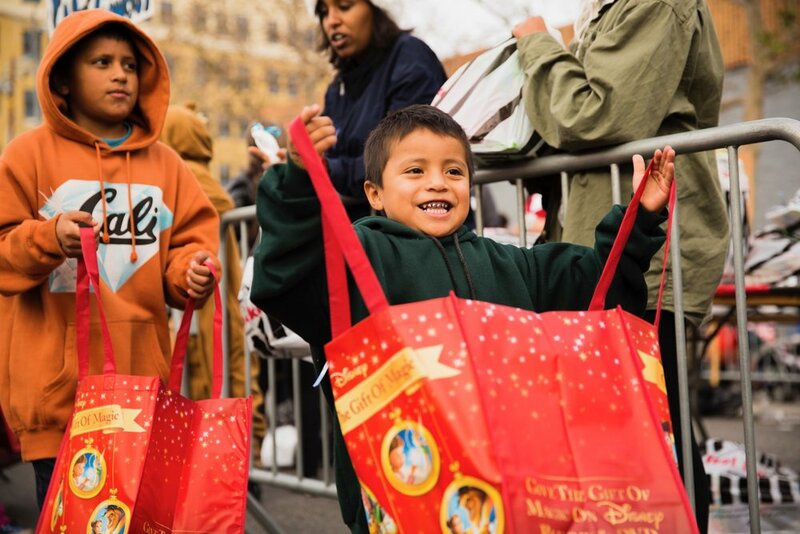 Friends of Disney greeted the children, and escorted them to the Toy Giveaway tables where each child received multiple toys, and blankets, hats, mittens and socks. Christmas Dinner food bags filled with nutritious, healthy and delicious food, blankets, hats, scarfs and socks were also distributed. Volunteer helpers and donations from companies and organizations all over the southland included: Toys for Tots, Disney, Deloitte, Metro, Galpin Ford Motors, Longo Toyota, Teamsters Local 848, SKAL, Woodcrest School, Joe Chung, Richard and Brenda Jurle, Romina Jurle, Kevin Anderson and Calvary Chapel Westgrove. "As you celebrate this joyful Christmas season with your family, please remember our homeless, hungry and hurting friends on Skid Row where this can be an especially heartbreaking and lonely time. We still need donations for Christmas. If you are able to help, Please call (626) 915-1981 or go online at www.fjm.org to donate. Your donation is tax deductible," said Joe Jordan, President of Fred Jordan Missions.